MINSHALL, William Edwin, Jr., a Representative from Ohio; born in East Cleveland, Cuyahoga County, Ohio, October 24, 1911; attended the public schools of East Cleveland, the University School, Shaker Heights, Ohio, and the University of Virginia at Charlottesville; was graduated from the Cleveland Law School in 1940; was admitted to the bar the same year and commenced the practice of law in Cleveland, Ohio; member of the State house of representatives in 1939 and 1940; enlisted in December 1940 as a private in the United States Army and served in the European Theater, G-2 section, Headquarters III Corps, and was discharged as a lieutenant colonel in March 1946; awarded Bronze Star; special assistant attorney general of Ohio, 1948-1952; general counsel, Maritime Administration, Washington, D.C., in 1953 and 1954; elected as a Republican to the Eighty-fourth Congress and to the nine succeeding Congresses and served from January 3, 1955, until his resignation December 31, 1974; was not a candidate for reelection in 1974 to the Ninety-fourth Congress; was a resident of Delray Beach, Fla., until his death on October 15, 1990; interment in Arlington National Cemetery, Arlington, Va.
Ralph Nader Congress Project. 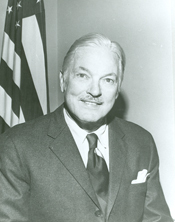 Citizens Look at Congress: William E. Minshall, Republican Representative from Ohio. Washington, D. C.: Grossman Publishers, 1972.